Kitchen Cabinets and Granite Countertops, Pompano Beach FL > Blog > Blog > Decoding Kitchen Sink Types – Which Kitchen Sink Type Is Right For You? Decoding Kitchen Sink Types – Which Kitchen Sink Type Is Right For You? Choosing a kitchen sink that works well for the design, budget, and layout of your kitchen is key to a successful remodel. You want to love your new sink; and to get the most out of your money you want to use all of the features it comes with. 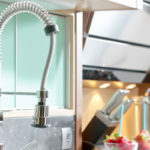 While adding an unnecessary add-on is no good for the budget, you don’t want to end up with a new kitchen sink that does not satisfy your everyday needs. 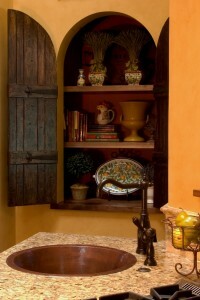 Some sinks resist all dings, and others can’t fit large pots that need to be washed. Pay attention to every last detail, from the size of the sink to how the texture and tone will match your kitchen cabinets and overall décor. Here we provide answers on some of the different options that are available when shopping for the right kitchen sink type. A variety of different materials can be used to create sinks; price, durability, and overall style should all be taken into consideration when deciding which sink is best for your remodel. 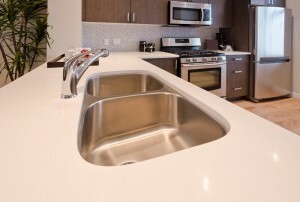 Composite sinks can be made with a variety of materials including granite and quartz. Composite sinks are relatively new but by boosting good value popularity continues to rise. Composite sinks are overall tough and can resist most scratches and abrasions; the most durable composite sinks are made of granite. 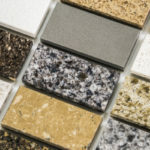 Granite consists of densely packed rock material, making it very resistant to scratches and stains, along with the strength to withstand the burning hot heat of cooking pans and heavy duty cleaning. A composite polyester/acrylic sink is another option you might consider because of the more affordable price, but if you plan to really use your kitchen sink, it cannot offer the same durability as granite and other higher end materials. A composite quartz sink is a more reliable option but it still can’t compete with the dependability of granite. Soapstone offers a really cool look that both classic and modern kitchens can delight in. Although beware, these sinks are constructed by joining together slabs of soapstone with epoxy. This process produces a sink that always has a flat bottom, not a very appealing trait when trying to wash food or crumbs down the drain. Porcelain is heat resistant and can be personalized to fit your specific style, although porcelain sinks can also be high maintenance. For starters, sharp impacts can cause damage, chips, or dents. Also, after a certain number of intense cleanings, porcelain begins to lose its original shine. A similar option is enamel over cast iron, since it’s not porcelain throughout it is less expensive but offers the same pretty outer appeal. By far the more expensive option but if you’re looking to pull off the old world style copper will… Copper sinks do not corrode or rust over time. Another benefit to copper sinks is their ability to ward off harmful bacterias. Unlike other materials that can house harmful bacteria for weeks, copper has shown to kill bacterial in a matter of a couple hours. Undermount sinks are built an inch or so below the edge of the countertop so that there is no defining edge where the counters and sink meet. Certain sink materials are heavy and prone to weak points if required to support the entire weight of the sink, an undermount can provide a reliable option in this scenario. This type of sink also makes clean up easier; just sweep crumbs and water directly back in the sink without any bumps along the way. Keep in mind: proper installation is a must to prevent leaking and other issues that can arise due to poor installation (Read More). Solid surface sinks rise up a few centimeters beneath the top edge of the sink, where your countertops prematurely begin to create a seamless match that easily escapes the eye. Solid surface sinks are available in a variety of materials and colors, so that you can match your sink and countertops perfectly. Also known as a drop-in or overmount sink, self-riming sinks fit directly over the counters, so that you can see where the sink ends and the counters begin. This can make brushing water and crumbs back into the sink less simple, not to mention dirt and stains can easily build up under the sink rim. So you love the size, shape, function, and color of your kitchen sink—now how do you make sure it matches your kitchen cabinets? Some sink materials are timeless and can match almost any setting they are placed in, take stainless steel for example. 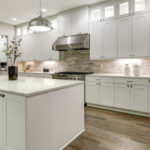 If you want to get more creative, you can add a white or granite kitchen sink to match your countertops for a seamless look that keeps people guessing. Take note of the hardware on your kitchen cabinets, if possible incorporate the same metals or colors on your faucet or other sink hardware for a cohesive look that fits together fabulously. 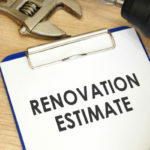 You can carry home a sample cabinet, but carting around a sample sink isn’t so easy; instead take a sample of the material you are debating and hold it up around your kitchen, against the wall, counters, cabinets, and appliances, to make sure it matches before pressing go (Read Full Article).